See this is exactly the sort of thing that makes me wish I had more possessions. I’ve been spending the last 3 days just outside of Paris with my homegirl and her lovely French boyfriend, in their little lime green apartment with a view of the melodramatic arch of La Defense. I’ve been wearing the same acid wash jeans for 3 days.And this has made me reflective on my decision to live like a gypsy out of a suitcase for the past few years. 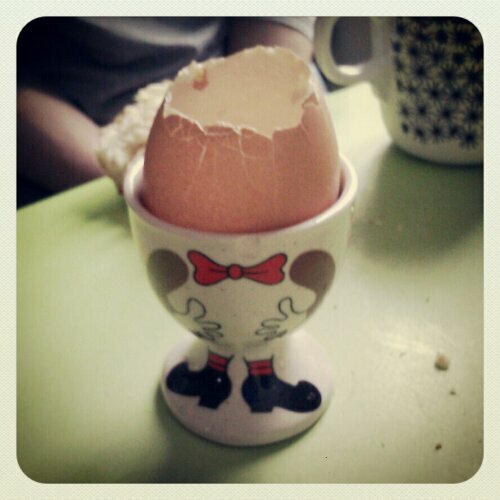 For instance, I don’t own any ridiculously cute eggcups. But would I trade in the constant feeling of unsettledness and easy freedom that goes with it in order to put down some roots and begin amassing a material representation of my progress in life…? Maybe for a matching salad spinner.